Manchester City's irresistible attack led the way in the Fantasy Premier League Bonus Points System (BPS) as they ran out 3-1 winners at Swansea City. Sergio Aguero (£13.0m) was awarded the maximum bonus points thanks to a score of 57 in the BPS. Having served a three-match suspension, the Argentinian netted twice upon his return, taking his tally to 11 goals in six competitive matches under Pep Guardiola. Kevin De Bruyne (£10.8m) received two bonus points. The midfielder produced 39 in the BPS after claiming two assists in the away win. He also chipped in with three successful dribbles, seven recoveries and two completed open-play crosses. Swansea duo Gylfi Sigurdsson (£7.2m) and Fernando Llorente (£6.3m) collected a single bonus point apiece with a BPS score of 28. In an all-action display, Sigurdsson provided the assist for Llorente’s first Swansea goal and supplemented this with six recoveries, three successful tackles and four completed crosses from open play. Aguero was ranked top in the ICT Index with a score of 16.9. In his first Premier League outing since Gameweek 4, the Man City frontman registered 12 touches inside the hosts' penalty box and fired four attempts on goal. Llorente earned the second spot in the Index, having matched Aguero for efforts inside the box (three) and attempts on target, with two apiece. Sigurdsson finished third with a score of 11.1 to Llorente's 12.2. He made more successful passes in the final third (13) than any team-mate and also registered three attempts on goal and a trio of key passes. Aguero's brace has already made a significant impact on the Fantasy Premier League transfer market. Over 158,000 managers have drafted him in this week; more than any other player. The striker will face Tottenham Hotspur in Gameweek 7, having scored 10 goals in nine appearances against them. The absence of Nolito (£8.9m) through suspension was softened by David Silva’s (£8.7m) return from injury. This brought De Bruyne on to the flank to allow the Spaniard a role alongside Ilkay Gundogan (£5.4m) in central midfield. De Bruyne has now risen to the summit of the overall FPL points rankings after producing points in five successive Gameweeks. 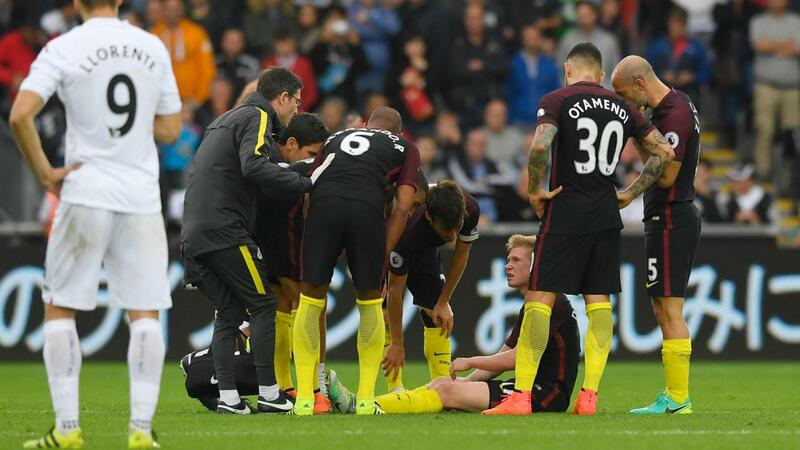 But De Bruyne's 20.3% ownership will be concerned after he was forced off in the second period due to a hamstring injury. Reports suggest that he may face up to four weeks on the sidelines. For the Swans, Stephen Kingsley’s (£4.1m) run of five straight starts came to an end as he was replaced by Angel Rangel (£4.4m) in the first XI, with Kyle Naughton (£4.5m) shifting over to left-back. Llorente’s first goal may keep him ahead of club-record signing Borja Baston (£6.9m) for the lone striker role, though Sigurdsson remains the most secure attacking FPL option under Francesco Guidolin. The playmaker has now produced points in successive home matches against Chelsea and Man City. Swansea welcome in-form Liverpool to the Liberty Stadium for Gameweek 7.